Bipolar depression neurobiology is an area that urgently needs more research. The treatment of a depression that follows an energized (hypomanic or manic) state remains one of the most difficult areas in psychiatry. 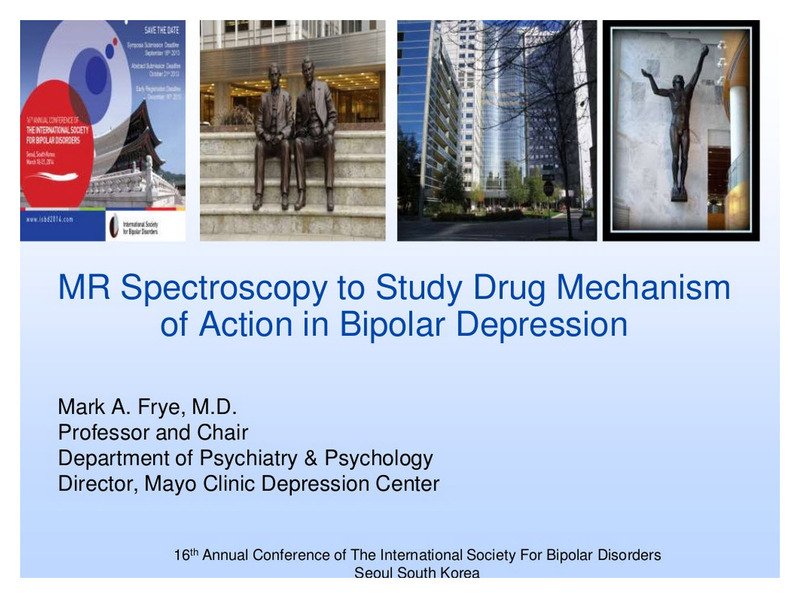 Mark Frye, Chair of the Department of Psychiatry at the Mayo Clinic, gave a presentation on this topic at the 2014 International Society of Biological Society conference that was held in South Korea. 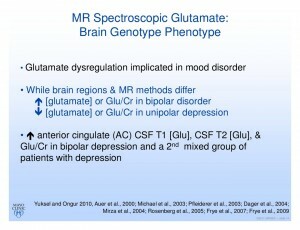 He summarizes what is known about the relationship between glutamate (the most common excitatory neurotransmitter) and bipolar depression in a review of the literature that may explain why bipolar disorder is associated with brain atrophy, as well as why lithium and lamotrigine have neuroprotective effects. Dr. Frye begins by talking about N-Acetylaspartic acid, or N-acetylaspartate (NAA), a chemical that is only found in brains in neurons. Levels of NAA in the brain are a marker of the number and health of the neurons in the brain. NAA is reduced in dementia, and following stroke, and, of more relevance, NAA declines in the brains of untreated patients with bipolar disorder. 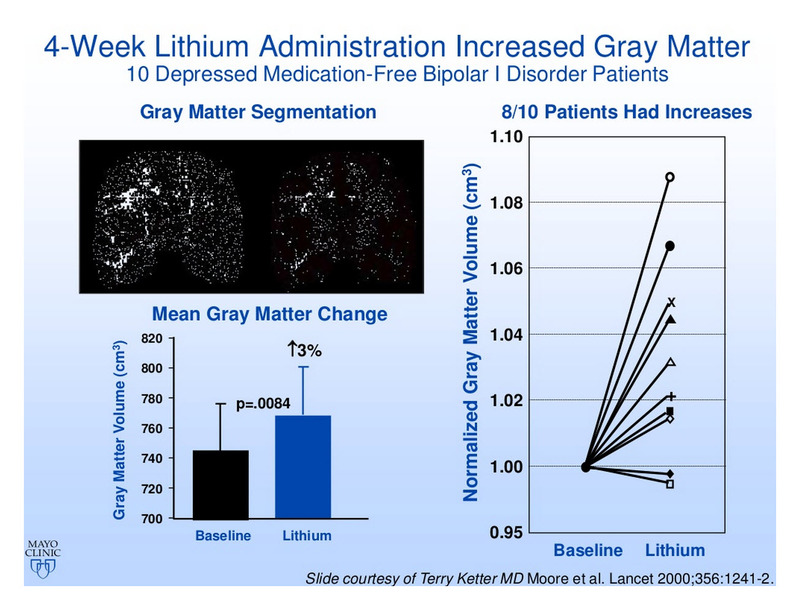 Dr. Frye then reviews data showing that the amount of grey matter (which is mostly composed of neurons) is reduced in the brains of patients with bipolar disorder. And both lithium and lamotrigine seem to reverse this effect. 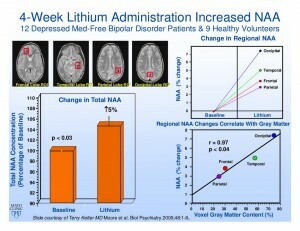 Lithium also increases the amount of NAA in brains, as measured by Nuclear Magnetic Spectroscopy (NMS). This is what you would expect given that it seems to be preserving grey matter. 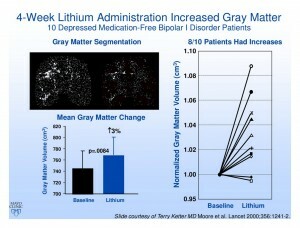 In addition, lithium seems to protect against the loss of grey matter associated with aging in people with bipolar disorder. Back to levels of NAA. In people with bipolar, NAA declines more rapidly in the brain than it does in the general population, and this mirrors the increased decline in grey matter in the brains of people with bipolar disorder. 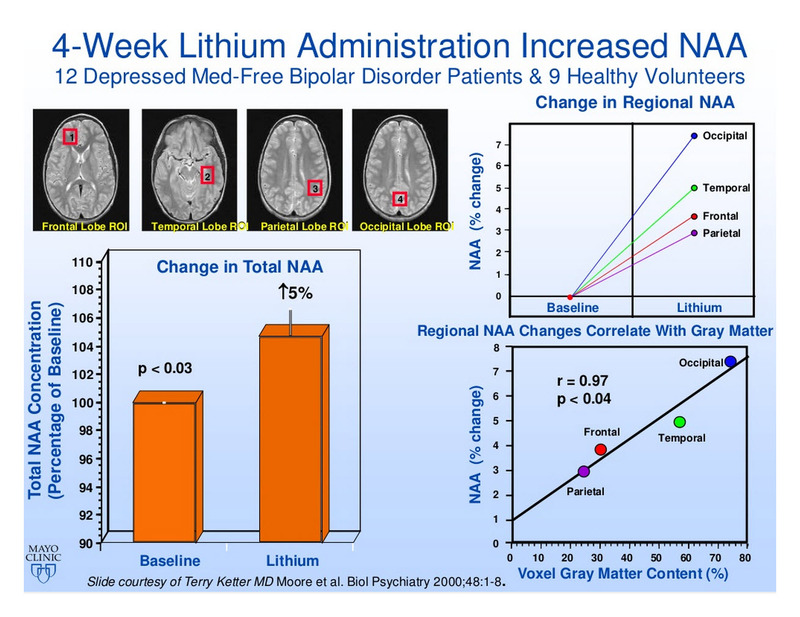 Hajek, in 2012, reported evidence that the rapid decline in NAA in people with bipolar did not take place in those who were taking lithium. 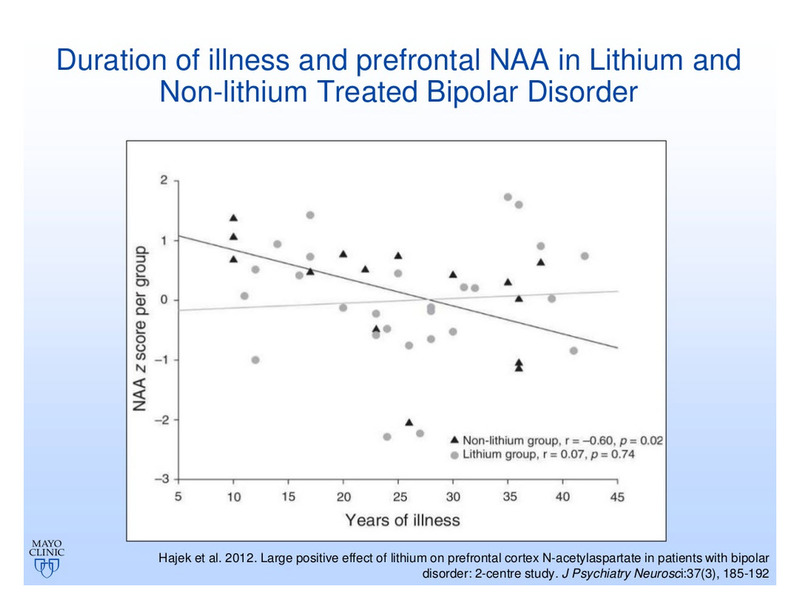 In the slide to the right you can see that, in general NAA was not lower in the brains of older bipolar patients who were being treated with lithium. 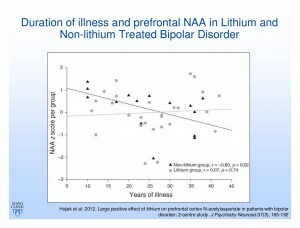 And this was in contrast to the reduction in NAA with age seen in people with bipolar disorder who were not treated with lithium. One theory about why there is this reduction in brain volume with age in those with bipolar, is that the change is related to neurotoxic effects of depression on the brain. Yvette Sheline published data in the American Journal of Psychiatry about ten years ago that correlated days of untreated depression with loss of volume of the hippocampus (an important part of the brain that is involved in storing memory. The longer the duration of untreated depression, the greater the loss of brain cells. 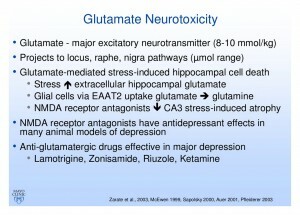 Dr. Frye then presents evidence suggesting that the neurotoxic effects of bipolar disorder may be related to increases in glutamate. Glutamate is the primary excitatory neurotransmitter in the brain and it seems clearly linked to neuron death in people with stroke and other neurological disorders. In those with a stroke, some neurons die due to the lack of oxygen as blood is prevented from flowing to the brain, but a larger number die due to the release of high levels of glutamate in brain cells under stress. A particular type of glutamate receptor (the NMDA receptor) seems especially tightly linked to neuron death. And, switching back to the topic of depression, NMDA receptor antagonists have antidepressant effects. In fact, drugs that antagonize glutamate’s activity in the brain are some of the most exciting new medications for treating depression. Among these drugs are ketamine (discussed elsewhere in this blog) – which is the fastest antidepressant known – and lamotrigine. 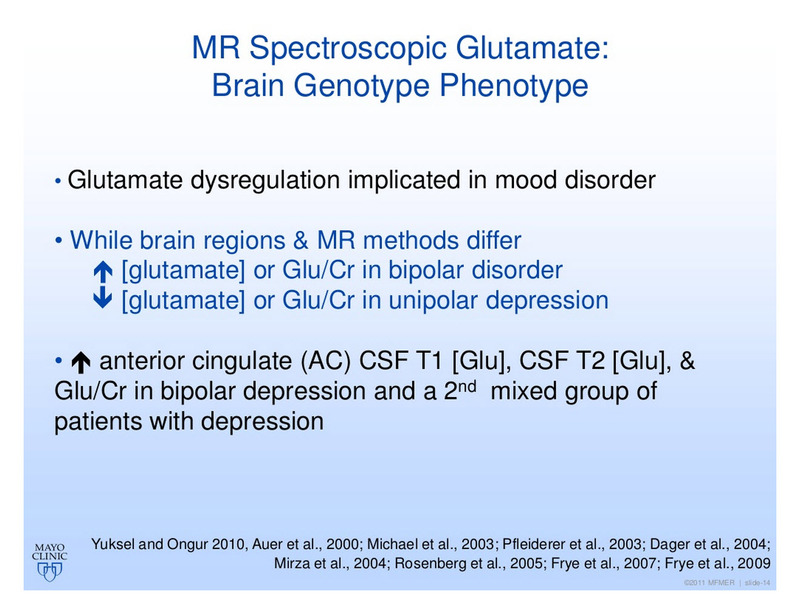 Dr. Frye presented some data that suggested that elevated glutamate in brains may be a phenomenon primarily or exclusively seen in bipolar depression. 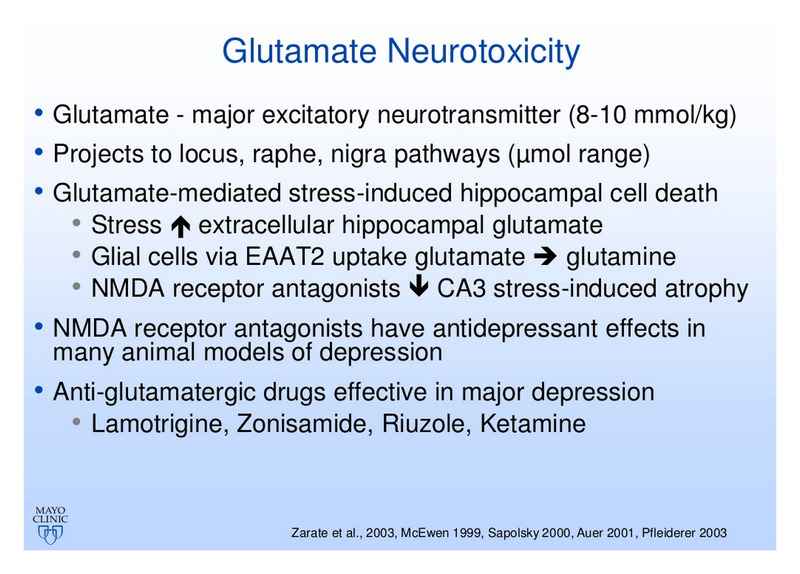 In the slide to the right he cites multiple studies which suggest that, in unipolar depression, there may not be an increase in glutamate. This is an intriguing finding because some of the people who have been using ketamine infusion experimentally as a treatment of depression have begun to suggest that this glutamate blocker may be most effective in treating bipolar depression. Perhaps more clinically relevant, since ketamine is not widely available, and its effects are rapidly reversed, lamotrigine also appears to work by reducing glutamate release in the brain. Lamotrigine blocks rapid sodium channel activity in neurons. Sodium channel activity is involved in all neurotransmission (see picture to the left). 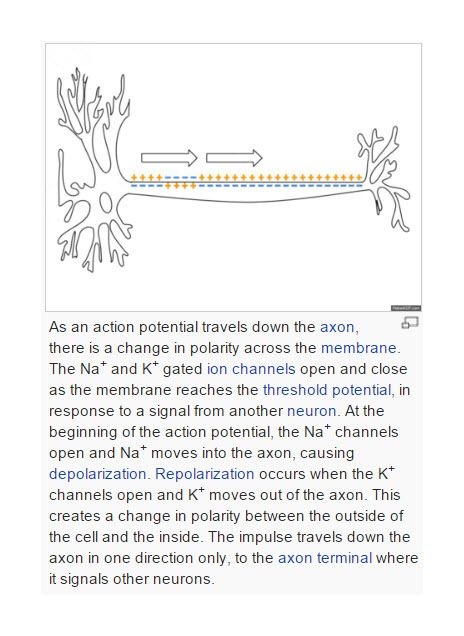 In the axon of a neuron, a small change in the resting potential of the cell triggers activation of sodium channels which allow sodium into the neuron and the cycle of activation of sodium channels and then potassium channels allows the signal to pass down the axon to the dendrites where release of neurotransmitters activates the next brain cell. But the effect of lamotrigine on neurotransmission seems to be greater in neurons that release excitatory neurotransmitters (glutamate) than it is on neurons that release inhibitory neurotransmitters (GABA). So the net effect of lamotrigine is to reduce the release of excitatory neurotransmitters (primarily glutamate). In many patients with a seizure disorder there seems to be an imbalance in excitatory and inhibitory neurotransmission. The brain becomes overactivated, leading to a seizure. But how is this relevant to bipolar depression? One type of bipolar depression that is particularly difficult to treat, is the bipolar depression that follows a manic episode. Perhaps a manic episode is the excitatory over-activation equivalent of a seizure and the depression that follows is just the consequence of the neurotoxicity of that episode? This is undoubtedly an oversimplification. 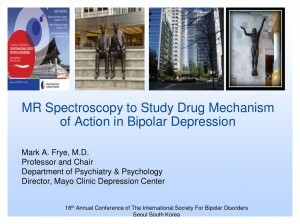 However, Dr. Frye presented unpublished data from a number of studies being done at the Mayo Clinic that show that bipolar depression is associated with reductions in NAA (presumed to be related to reductions in brain function), particularly in areas of the prefrontal cortex where reductions in activity have been noticed in depression. He also presented preliminary data showing that lamotrigine seems to reverse these reductions, preserving NAA in the prefrontal cortex. 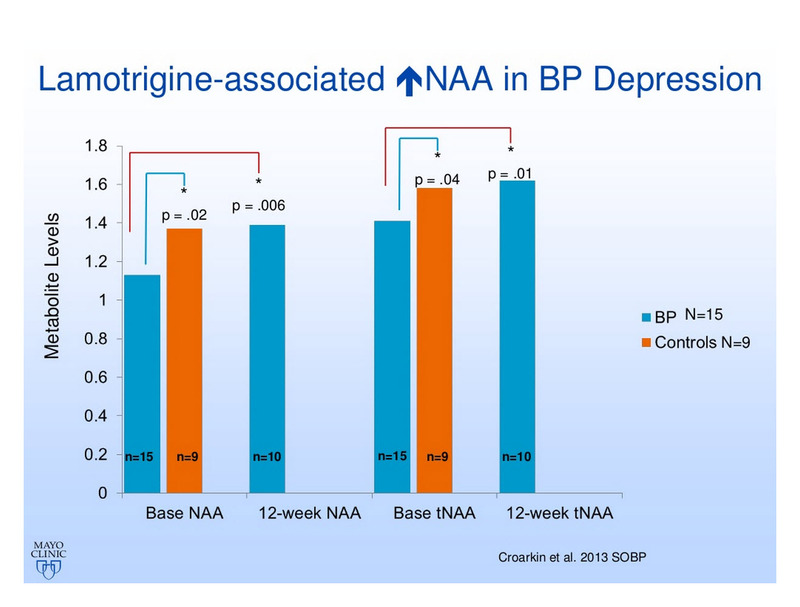 He concluded by suggesting that NAA activity may be a useful way of assessing the potential benefits of lamotrigine in patients with bipolar depression. Perhaps NMR spectroscopy could be used to distinguish between patients who clearly have a positive response to lamotrigine as opposed to those who are non-responders.